We left Sasebo and traveled to Yokosuka on Tuesday the 26th. Of course it was a long trip. 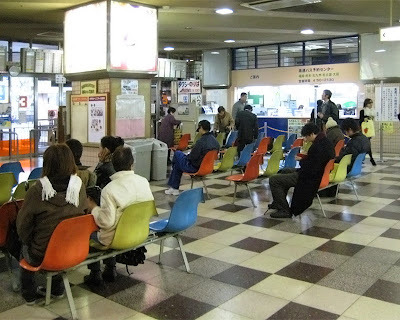 We started of that morning taking a taxi to the Sasebo bus station. Not exactly the most exciting place but I do have a picture. The bus ride from Sasebo to Nagasaki Airport takes about one and a half hours. When we got there we had about two and a half hours before our flight (I'll be posting more about that later). I really didn't pay too much attention to our flight details until we were about to board. 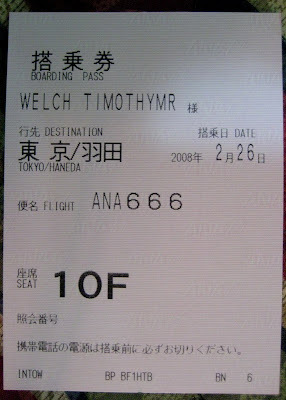 Our flight number was a bit disturbing, 666, we were wondering if this might be the Boeing 767 to hell. Here's the plane...looks normal. 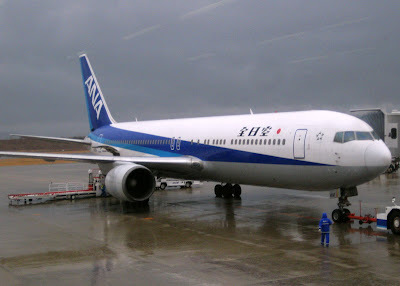 Fortunately all went well and we landed at Haneda with no detour to hell. By the way, here's a picture of the seating ticket that ANA gave me when I checked-in for my flight. The next leg of our trip was a train ride to the Yokosuka-chuo train station. With a bit of luck we got the express train. After that it was a two taxi ride to the Navy Lodge here on base. One taxi to the Main Gate and a base taxi to the lodge. After getting here and dropping our stuff in the room we did go out...pictures later.